I've had an ambition to climb Moelwyn Mawr ever since I climbed its smaller sister hill Moelwyn Bach back in the early 1960s. Using public transport there is only one possible approach to this hill and that is from the Blaenau Ffestiniog side of the mountain. 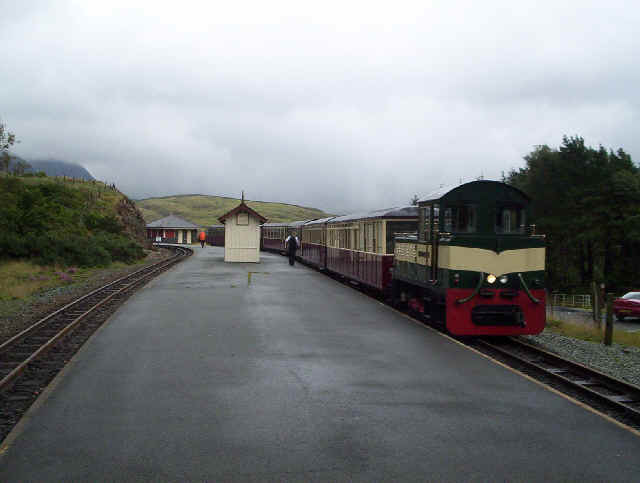 The bus from Dolgellau arrived in Blaenau just in time for me to catch the 10.30 Porthmadog train on the Ffestiniog Railway to its first stop at Tanygrisiau. There's also a very frequent local bus service but the train is a lot more fun and only a little more expensive. As can be seen the August Welsh weather was doing its best to spoil my day with thick cloud, wind and rain for much of the day. My train has just arrived and the crew seemed somewhat surprised to see a hiker alight. My return trip at the end of the walk was behind a steam locomotive at the head of a very full 10 coach train of day trip tourist. In my rather wet and bedraggled state I seemed to be viewed as something from another planet! 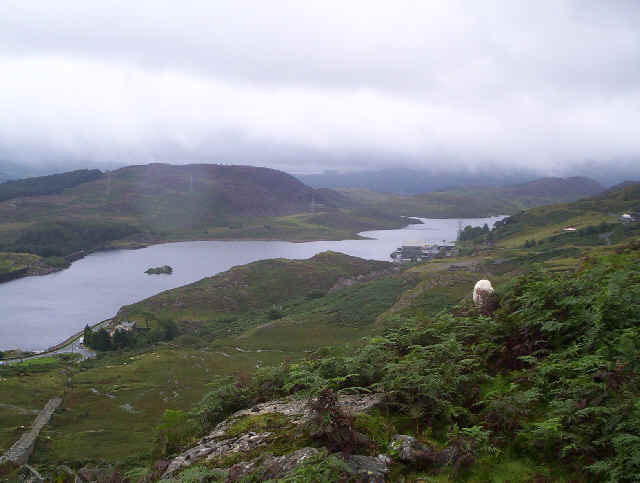 The walk is dominated by the influences of the Stwlan hydro-electric pump storage lakes and the remains of the slate industry. 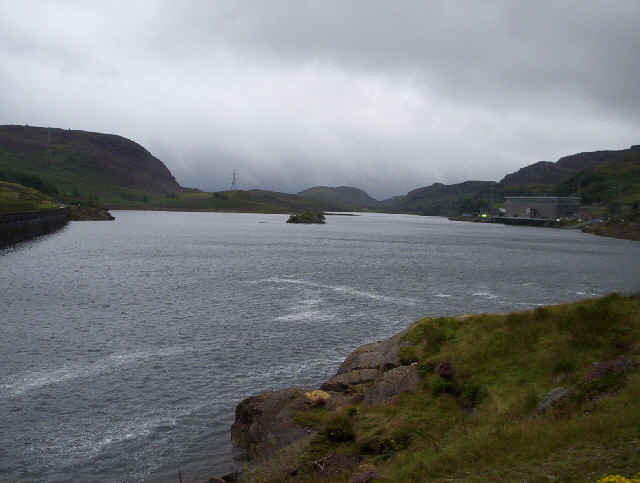 Here is Llyn Tanygrisiau with the turbine building on the right. 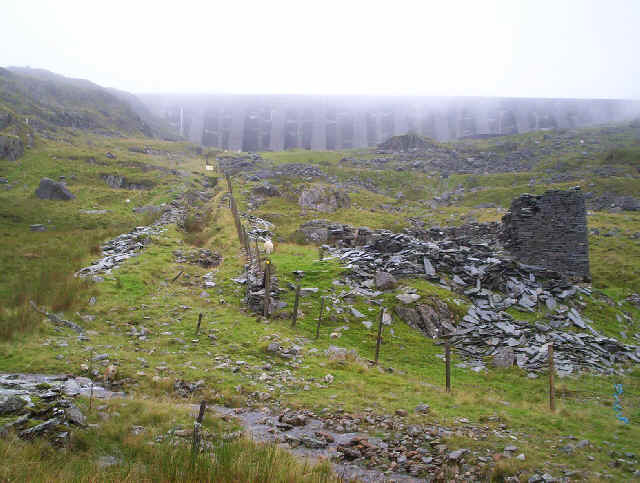 The first part of the walk uses the paved access road to the Llyn Stwlan dam, which begins near the station. In the background is the Cwmorthin Quarry. Height is gained easily and another piece of evidence of the slate industry is passed; an disused inclined plane that runs down from a quarry to the railway. At the top of the inclined plane it passes through a tunnel to reach a disused quarry on Moel-yr-hydd. 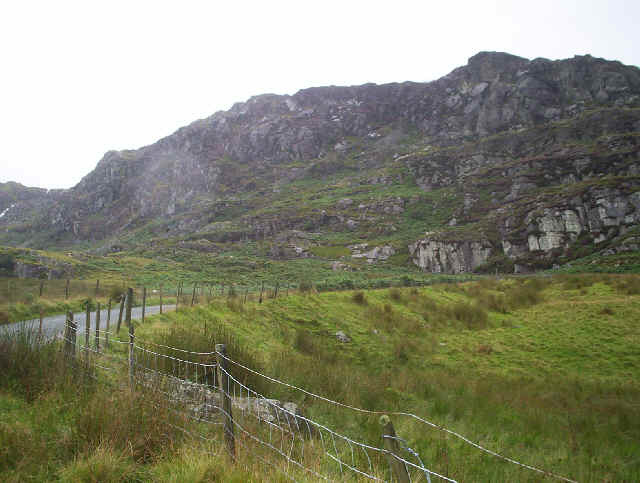 Some guide books suggest this as a route up to Moelwyn Mawr but it looks very steep and potential dangerous. 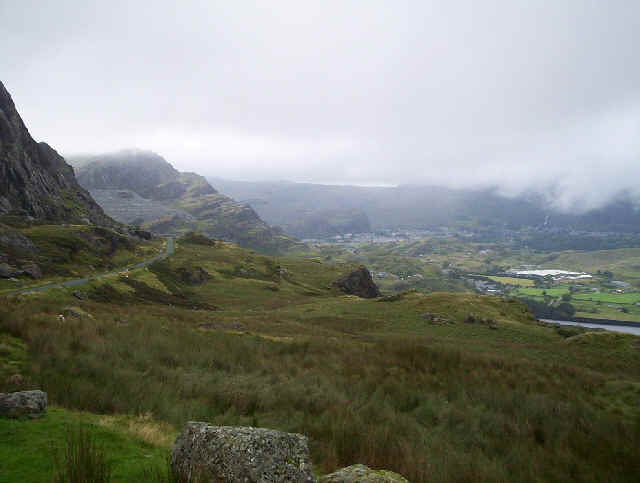 Looking back towards Blaenau Ffestiniog. 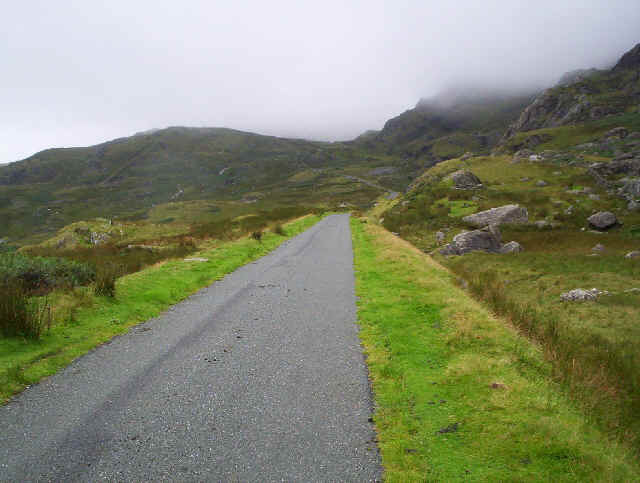 The access road looking towards the Llyn Stwlan dam. At a point just before the road begins a series of hairpin bends up to the dam a footpath sign points the way onwards. The track follows the remnants of an incline up towards the dam which suddenly appeared out of the cloud; it's a rather menacing sight especially when standing at its foot. I could hear the voices of maintenance staff working high above me; a slightly strange feeling. The path scrambles up through rocks to emerge right on the end of the dam. There's a walkway along the dam which I had intended to use on my return. It was at this point that I began to question the wisdom of going further as the mist was extremely thick with visibility little more than 10 metres. Clearly I was not going to have any views. Inevitably, the footpath disappeared and I was clearly going to have to find my way to the next stage of the walk using compass and GPS. I set the way mark on the GPS for Bwlch Stwlan and decided to carry on. The climb up to the Bwlch was across grass for the most part. Another inclined plane was passed - shown on the Harvey's map and a series of derilect buildings were useful "handholds" At the bwlch a clear path led off in the direction of the first summit Craigysgafn. To my dismay it was steep and in places more exposed than I'd expected, with some rather large drops. Given the wet and slippy conditions I decided that I wasn't going to return this way. Eventually the summit of Craigysafn (689m - 2260 feet) was reached . The path continued dropping slightly before beginning the climb to Moelwyn Mawr itself. Stoney ground on the way up turns to a grass and flat summit with the cairn being at 770m - 2526 feet. Weather conditions were unpleasant with rain and a strong wind making me forget to take a photo. Without thinking I wandered along the summit ridge north-westwards for a few hundred yards before realising I was going in completely the wrong direction. A return to the summit and a compass bearing saw me off down the north east slopes of the hill heading in the direction of Moel-yr-hydd. There's an intermittent track but much of the time I simply headed over the moorland in the right direction. Eventually I saw some warning signs referring to the path being dangerous; the huge holes of the Rhosydd Quarry loomed out of the fog. 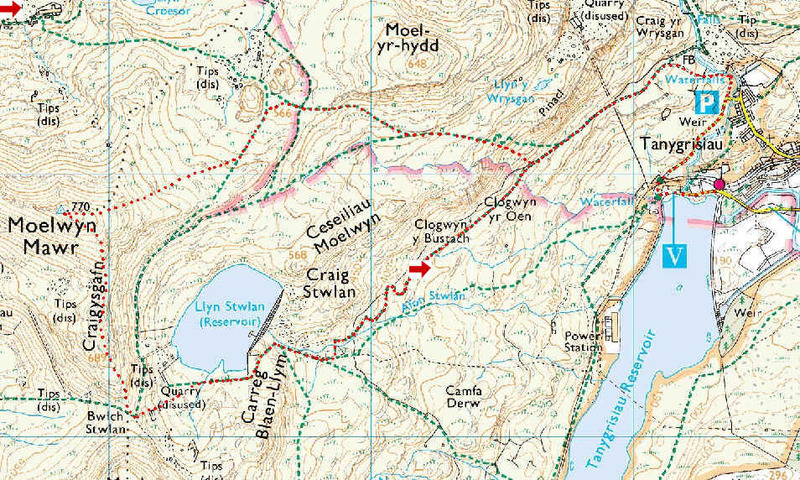 I found the path marked on the map that leads down from the quarries to Tanygrisiau, which allowed me to make good progress downhill. Inevitably, of course, this disappeared and i was left at the top of a steep, boulder and heather covered hillside with the road tantalisingly visible a few hundred feet below. I could, however, see that there was a way through the crags and rocks so it was simply a case of making my way carefully downhill, often on my bottom and thinking carefully where to put my feet. The photo shows the hillside! 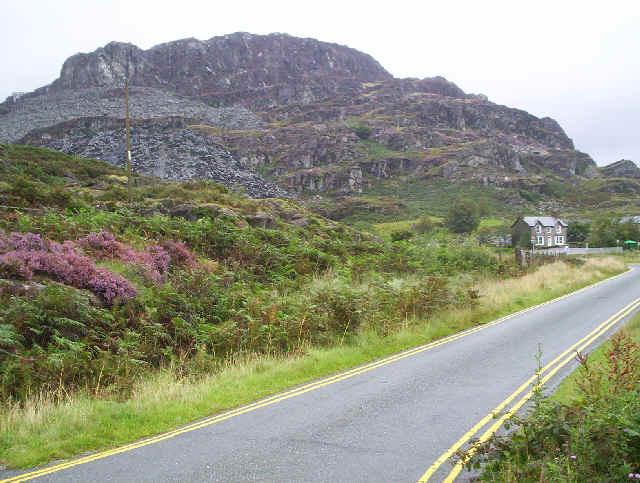 Eventually, I reached the road and arrived back in Tanygrisau in time to catch either the 14.30 bus or the 14.30 steam train. The steam train won.